An added dimension of the Tolstoy Farm was the decision to hold co-educational classes, and indeed to encourage the boys and girls to do everything together. The activities which the young contributed their energies to at Tolstoy Farm included general labouring, cooking, scavenging, sandal- making, simple carpentry and messenger work. 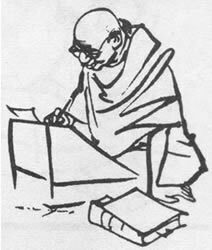 But Gandhi did not recommend manual activities merely because they were materially productive or remunerative. In addition to productive crafts, manual work of a purely constructive nature was also essential for the maintenance and development of community life. The contribution of work such as sweeping, scavenging and water fetching was seen to be invaluable to the psychological, social and moral well-being of an integrated community. Gandhi's objective in this context was to inculcate the ideals of social service and citizenship through all the activities of children from the earlier formative years.